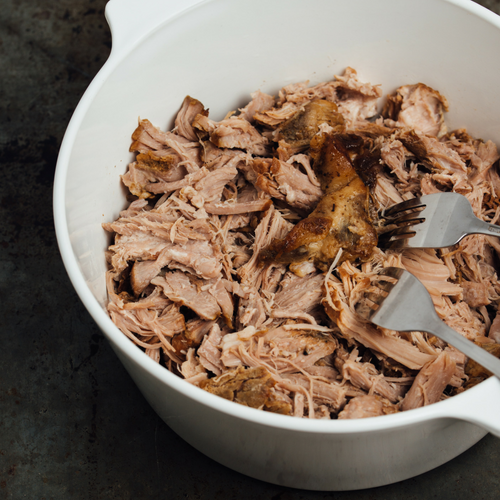 Your mouth will be watering as this slow cooks all day long in the crock pot. Rinse roast and place in bottom of crock pot. In a small bowl combine all remaining ingredients. Spread over the roast, turning the meat to coat all over. Cook in the crock pot for about 6 hours on high or 8 to 10 hours on low. There is no need to add any liquid. The meat will be fork tender and just fall off the bone and shred easily when it's ready. Remove the fat and bone(s). Shred the rest of the meat with two forks. Enjoy! We use Mission street tacos and pan fry them with just a brush of avocado oil. Once they are nice and toasty and slightly crisp, we fill them with the pork, cabbage and lime. So simple! Other great toppings include chopped up avocado, salsa, tomatoes, and/or cheese. But we like the simplicity of just the meat cabbage and lime. We serve the tacos with black beans and chips & salsa on the side.